Currently he is the State Minister of Housing and Samurdhi. 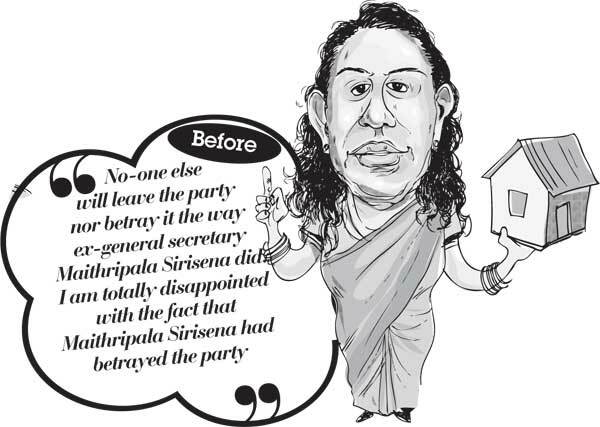 The unexpected bet In another instance she had made a bet on her house in Pelmadulla that former President Rajapaksa would win the election. She is now the State Minister of Environment. 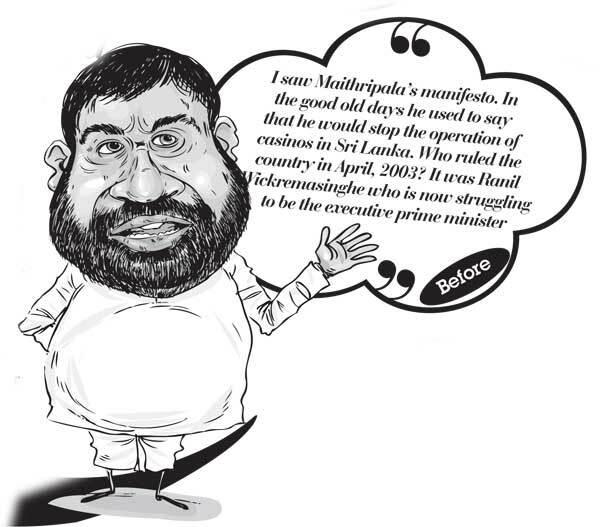 Former minister of telecommunication & information technology, Ranjith Siyambalapitiya said, “I saw Maithripala’s manifesto. 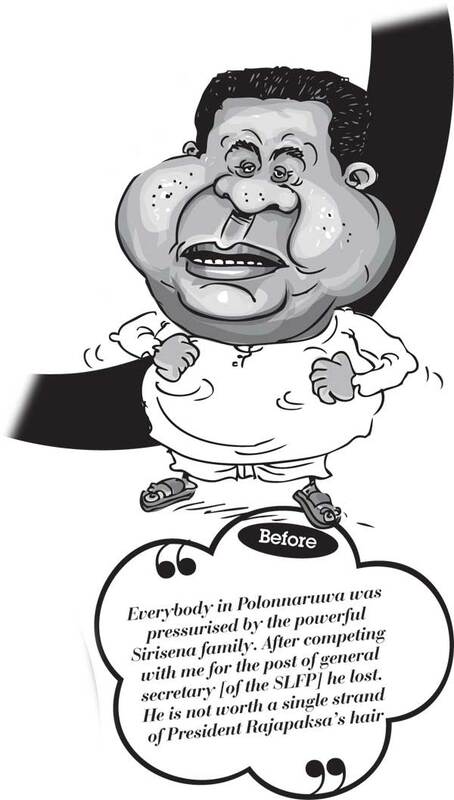 In the good old days he used to say that he would stop the operation of casinos in Sri Lanka. Who ruled the country in April, 2003? It was Ranil Wickremasinghe who is now struggling to be the executive prime minister. Their prime goal is to defeat Mahinda Rajapaksa and get something done afterwards. This is similar to a child’s mentality. He is now the Deputy Minister of Home Affairs. During another Sri Lanka Freedom Party press conference he said, “Our president says he has put an end to poverty, reduced maternity deaths, reduced infant mortality rates, built highways, developed the country, built irrigation channels provided electricity to rural areas and therefore to give him another chance as the president of the country. What does Maithripala Sirisena say? “I couldn’t include pictorial warnings in cigarette packs ; I couldn’t introduce the National Drug Regulatory Authority Act; I couldn’t stop the illegal import of lethal drugs which cause kidney diseases in Polonnaruwa because of some people who have illegally obtained money from the Ministry of Health. Therefore, please vote for me. Currently however, he [ S.B. Dissanayake] is the Minister of Rural Economic Affairs. 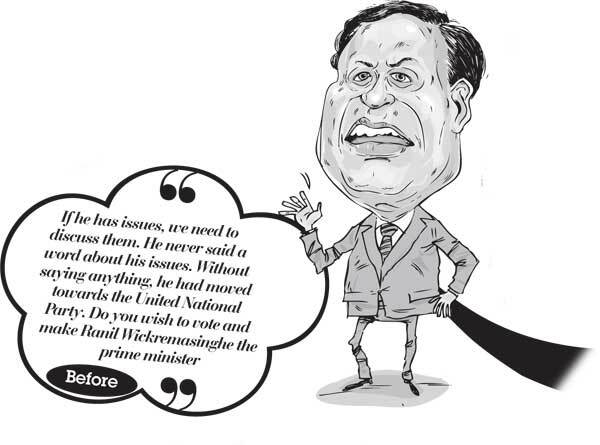 Former deputy minister of finance and planning, Dr.Sarath Amunugama criticised MaithripalaSirisena’s decision to defect from the government and take up the position of the opposition’s common candidate. At an event held in Galagedara, Kandy in November 2014, he said, “If he has issues, we need to discuss them. He never said a word about his issues. Without saying anything, he had moved towards the United National Party. Do you wish to vote and make Ranil Wickremasinghe the prime minister. What did Maithripala Sirisena say in his speech yesterday? He said that if he wins, he would step down in 100 days and make Ranil Wickremasinghe the prime minister. 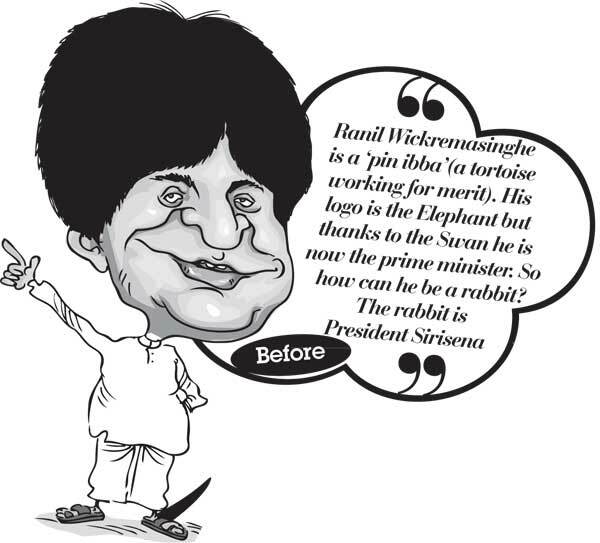 Did we give him the post of the general secretary of the party [SLFP] for this? Maithripala is attempting to race two horses at once. One is the horse of the UNP and the other is the horse of the SLFP. This is never possible. Currently he is the Minister of Higher Education and Research. Friends The main issue is not the girls and boys accepting "santhosam" . Most politicians except a few ,rare breed nowadays ,come to politics to first look after themselves. Do not you thinks they must first to survive ,even to serve us the public. Are you all blind to see or not intelligent enough to understand the manipulations of the "compassionate pala" who is responsible and therefore should be blamed more for the conduct of all these boys and girl for offering "santhosan" and they are of course also to be blamed for accepting "Santhosan. Thanks for publishing the truth KAMATHI,We are the fools and the clowns not the politicians. Let them be UNP,JVP,UPFA or any other party. All these have taken us for rolar coaster ride. One example is yahapalanaya theory or promise of 20 odd ministers. I feel that the way Maithriee and Ranil is batting we will surpass all World Cup records. Well MY3 promised yahapalanaya. But all we can see is allegations and corruption. The bad things MR did in nearly ten years, these idiots have done in 75 days. Right now Sri Lanka needs Statesmen , who will really serve the people and the country,Not politicians who will serve only themselves! It is the voters responsibility cast their supreme vote to a candidate who is sincere and genuinely want to do a good services to the country and nation. The way things are happening these useless politicians will think that voters are set of fools.Please do not cast your supreme vote those people who rob the country and poor people.